Here's something that's not found in abundance. 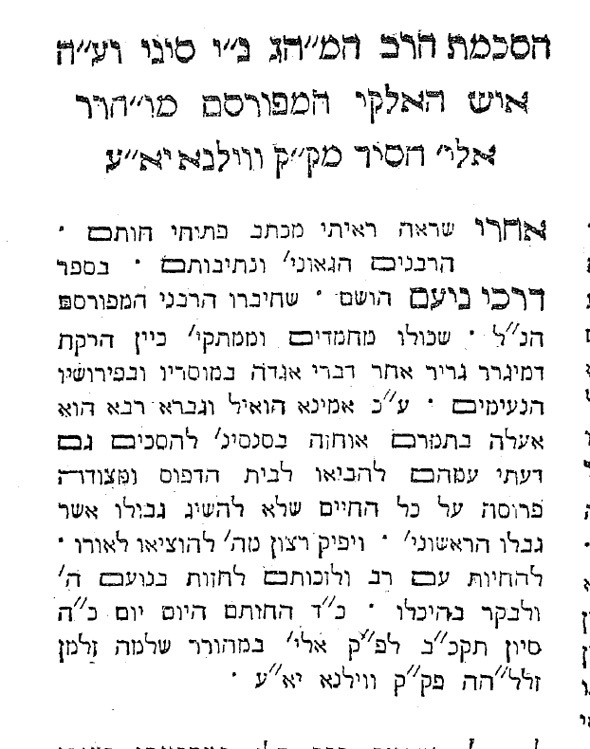 It's the Vilna Gaon's haskamah to a work printed in Koenigsberg in 1764, Darke Noam by R. Shmuel ben Eliezer of Kalwaria, on the Rabbah bar bar Hannah aggados. As you can see in the little rhyme in the beginning, the Gaon signed because the other rabbis signed. Perhaps wisely, this wasn't something he would repeat very much. My thanks to Eliezer Brodt for drawing my attention to this. I love the rhyme--chosam, nesivosam, husam, mefursam! I doubt the Gaon predicted Ashkenazim reading in neo-havara Sefaradit in the future. Thank you! At least someone appreciates it. Portrait of the artist as a young mapmaker. A proverb about London among Polish Jews, 1822. They destroyed the tea, sacré bleu! On Reverend's Handbooks of a century ago, Pt. II.